Les Muma’s career in data processing began with “Cooperative Education Assignments” at Southern Bell (Jacksonville, Florida) and International Mineral and Chemical (Bartow, Florida) while attending the University of South Florida. Upon graduation, Les joined IMC in the IT Department. He later held a similar position at a Board of Public Instruction in Central Florida before joining Price Waterhouse in Tampa, Florida. Les entered the “bank” data processing business in 1971 when he joined a large savings and loan in Tampa. In 1973 he became President of the savings and loan’s data processing subsidiary (Sunshine State Systems) established by the savings and loan to service other financial institutions. In 1984, he and his management team did a leveraged buyout of Sunshine State Systems, by then servicing 40 clients, and within six months merged with similar company in Milwaukee, Wisconsin to form Fiserv. Les held the position of President and Chief Operating Officer of Fiserv from 1984 until 1999 until he was named Chief Executive Officer. Les retired from Fiserv June 30, 2006. From 1984 to 2006 Fiserv grew, through a combination of organic growth (generally 8-10% per year) and by acquiring complimentary companies (128 acquisitions from 1984-2005). During those 22 years, Fiserv made the transition from being a relatively small private company with two locations, 350 employees and $21 million in revenue into a publicly traded company (FISV’s IPO was in 1986) with more than 240 locations worldwide, 23,000+ employees and revenue in excess of $4.0 billion. While in Milwaukee Les served on many charitable boards, including United Way of Greater Milwaukee, United Performing Arts Fund of Milwaukee, Boys and Girls Club of Wisconsin, Big Brothers and Big Sisters of Wisconsin and Junior Achievement of Wisconsin. Les has served the greater Tampa Bay community well since returning to Florida in 2006. He is the former Chairman of the Board of the University of South Florida Foundation and Chaired the Foundations $600 million “USF: Unstoppable Campaign” from 2006 to 2013. He also served on the Board of Tampa General Hospital. 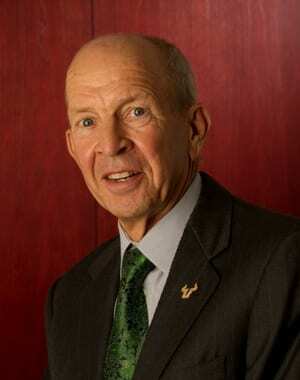 Les is a Life Member of the USF Alumni Association and is a member of the College of Business Dean’s Advisory Board (2005-present), and the 1956 Society. Les currently serves as a Director of the USF Foundation, a Director of the Gold Shield Foundation and a Director of the Copperhead Group that puts on the Valspar Championship, the Tampa Bay Area’s only PGA tournament. He also is a Director of the Jacksonville based, FIS Global, the world’s largest global provider of dedicated banking and payments technologies. Les was born in Cumberland, Maryland and was raised in Florida. He and his wife Pam reside in Belleair, Florida. Their daughter, Lisa is married and lives in Charleston, South Carolina with her husband Jon, and their two children, Jessica and Jonathan.